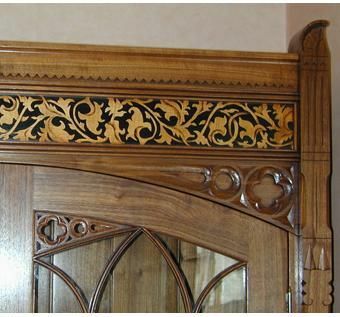 My client's Victorian home inspired her to do her dining room in the Reformed Gothic Style of the late Victorian Gothic Revival. 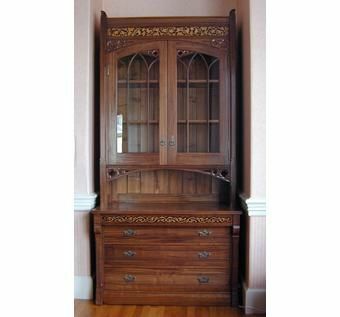 Our collaboration resulted in many pieces of furniture: dining room table, two arm chairs, ten side chairs, sideboard, and this china cabinet. 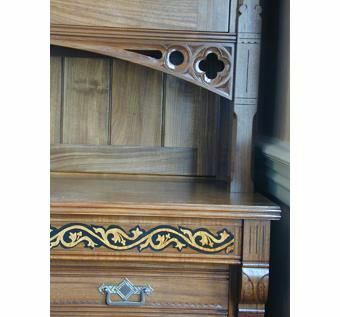 In this piece are found features typical of the set: Marquetry frieze work, gothic tracery, gothic arches, chip carving as found in late Victorian woodwork, and a hint of flying buttresses. The wood is walnut and is finished with a hand rubbed oil finish and wiped glaze to suggest age.